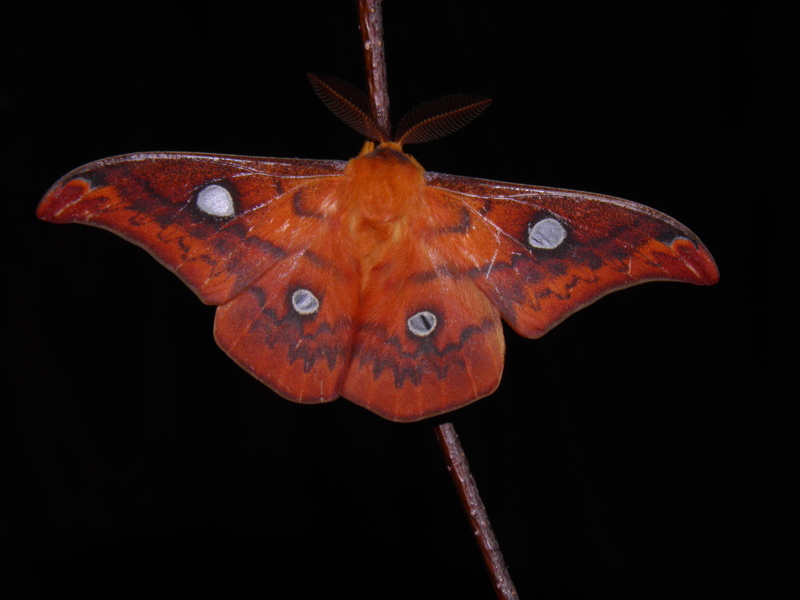 Rhodinia fugax — “Squeaking silkmoth” | Welcome, visitor! 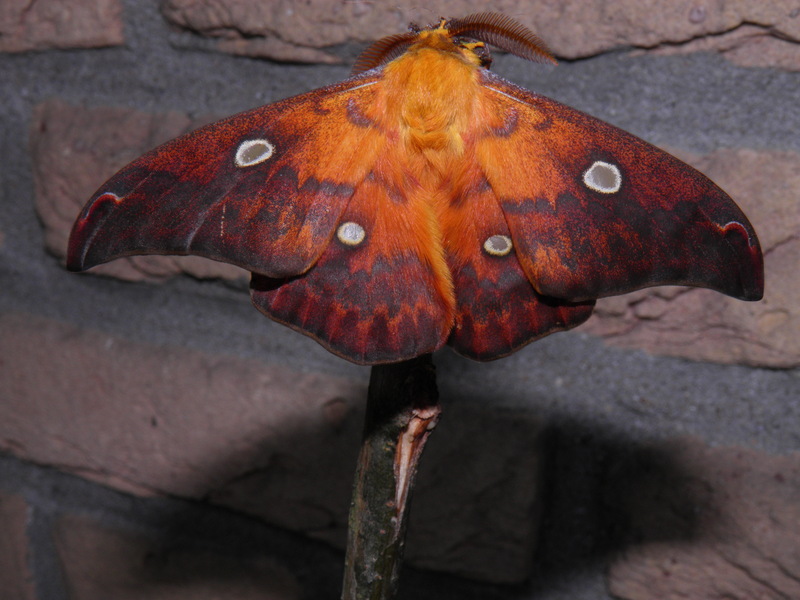 Rhodinia fugax is a medium sized silkmoth from palearctic Asia and the Far East; they have been reported in Korea, China, Japan and Russia. The moths of Rhodinia fugax hatch quite late in the year – they have one generation in autumn (October-November). In autumn the adults can blend in quite well with the environment due to their yellow and orange autumn-leaf like colours. Males are variable and are darker than the female: they seem to range from nearly black to dark orange, bright orange to brown and yellow. Females are not nearly as variable as the males and are always yellow, although the thickness and colour intensity of their submarginal band can differ a lot. Adults have quite hairy bodies and legs to aid their thermoregulation during the chilly autumn days. Briefly after pairing, the females start depositing eggs. Eggs are usually laid on twigs of the food plant or on the surface of the empty cocoon the female hatched from. These eggs will not hatch until next spring; the overwintering stage in the life cycle of Rhodinia fugax are the ova. In order to complete their development the eggs of Rhodinia fugax need to experience a long period of cold temperatures; they even survive frost. In spring, when the temperatures gradually start rising again, the eggs hatch – usually well synchronised with the development of suitable leaves on the plants and trees they feed on. 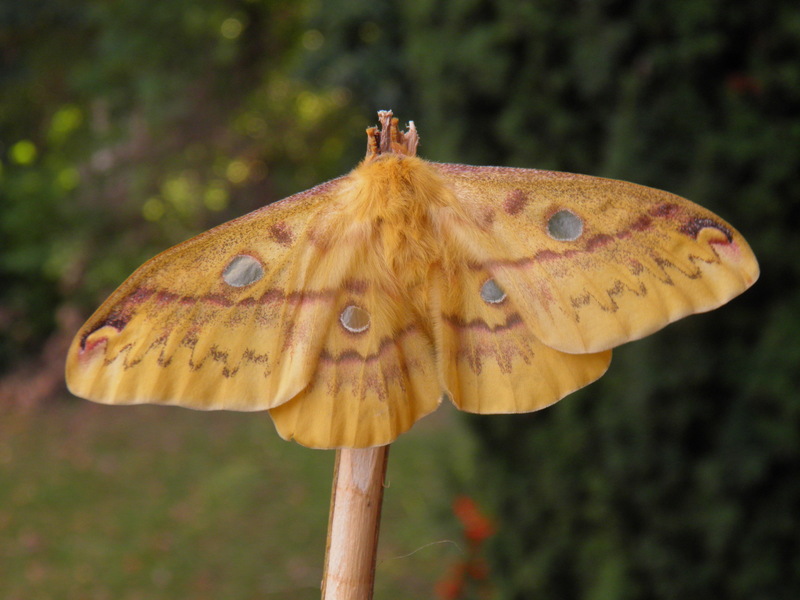 The name “squeaking silkmoth” actually refers to the caterpillars and not the moths (imagoes). When touched, the caterpillars can squeak loudly to discourage potential predators from attacking them. By quickly contracting their bodies, they can force air through their spiracula. This makes a squeaking sound that sounds slightly similar to a rubber duck or perhaps a mouse! 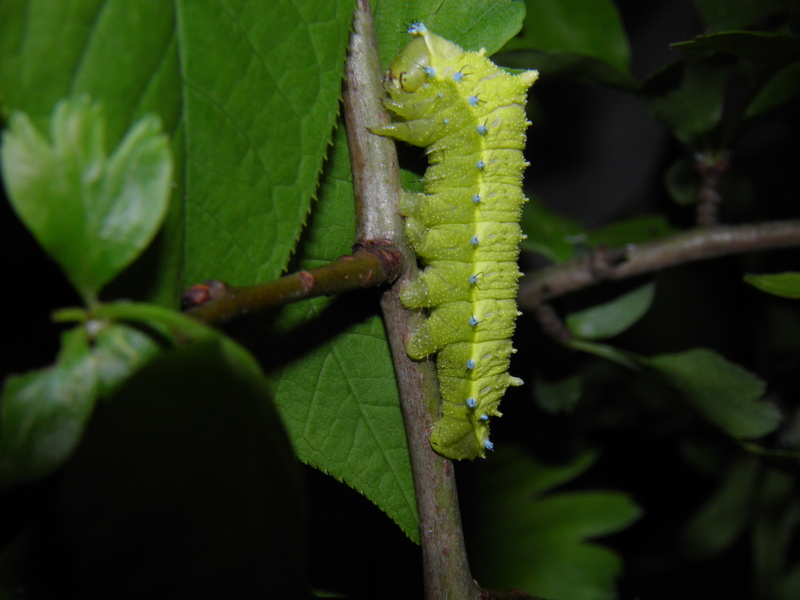 The caterpillars are ‘apple green’ with colourful blue tubercules covering their bodies. 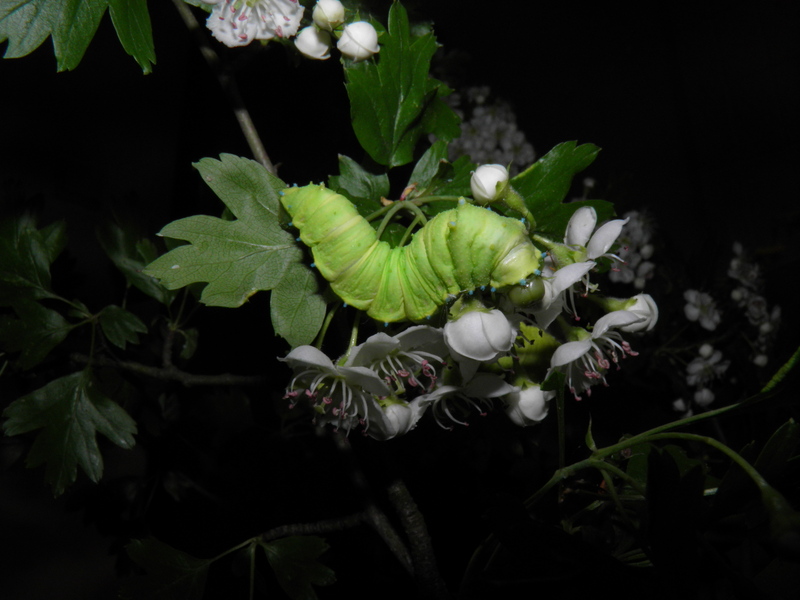 They can feed on a wide variety of food plants, but some of their favorites seem to be Konara (Quercus serrata), Zelkova, cork-tree (Phellodendron amurense), and cherries (Prunus sp.). However they are recorded on many types of Rosaceae such as fruit trees (cherries, plum, apple) but also hawthorn (Crataegus sp.). Willow (Salix), Platanus, Sweetgum (Liquidambar) and many more types of decidious trees and shrubs. 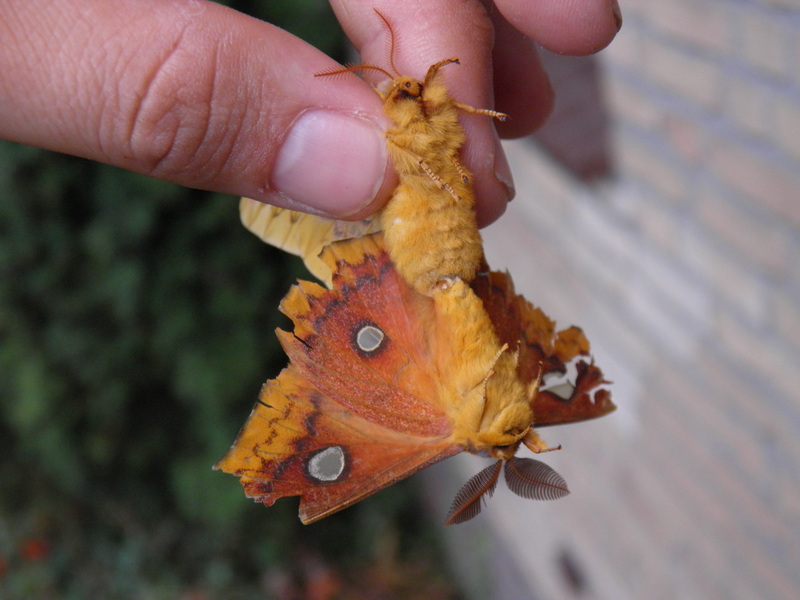 They hatch in early spring and start spinning cocoons in late summer. 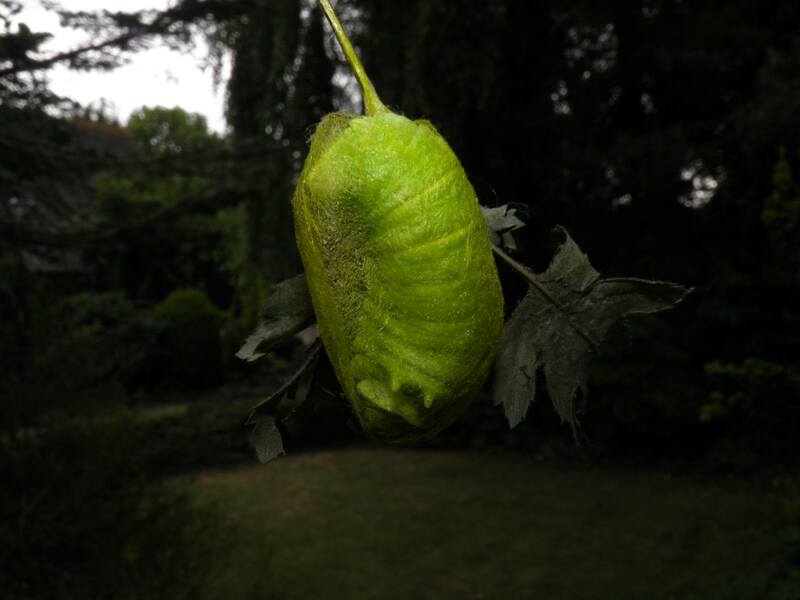 Interestingly the cocoon of Rhodinia fugax has green silk. The cocoons are shaped like a purse and have a small slit on the top that can split open which functions as an escape hole for the emerging moth. They only have one generation per year. Special notes: Overwinters in the egg stage; spends a lot of time in the final instar and may test patience. The eggs of Rhodinia fugax overwinter, and take multiple months to hatch after experiencing a prolonged period of cold. Depending on your local climate, overwintering eggs can be stored outside during winter – a prolonged period of cold is essential for their development. Otherwise, eggs can be overwintered in a fridge or cold basement. They are even able to handle freezing temperatures for a brief amount of time. I personally store them in bubble-wrapped enveloppes within a small plastic tube. In spring, the eggs can be warmed up on room temperature (make sure not to warm them up before the food plants have grown foliage) after which they will hatch within a few weeks. 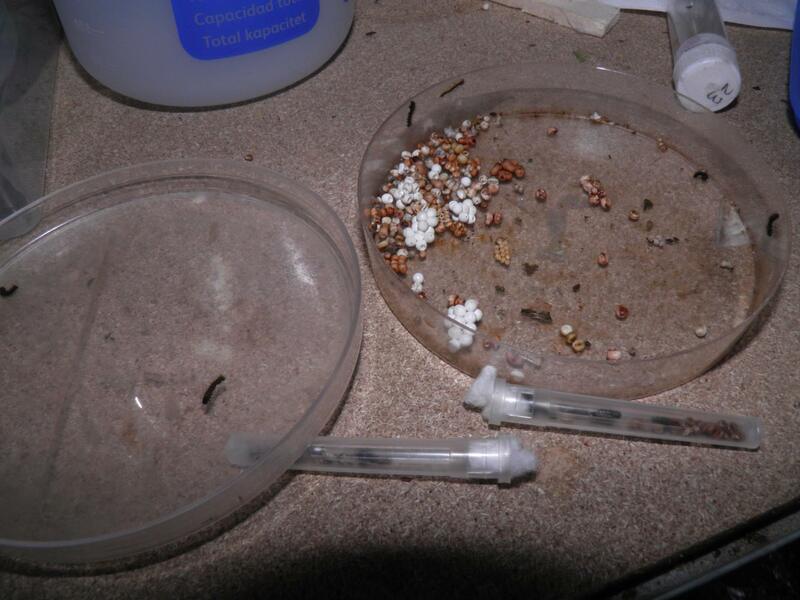 They can be hatched in small plastic containers or petri dishes. 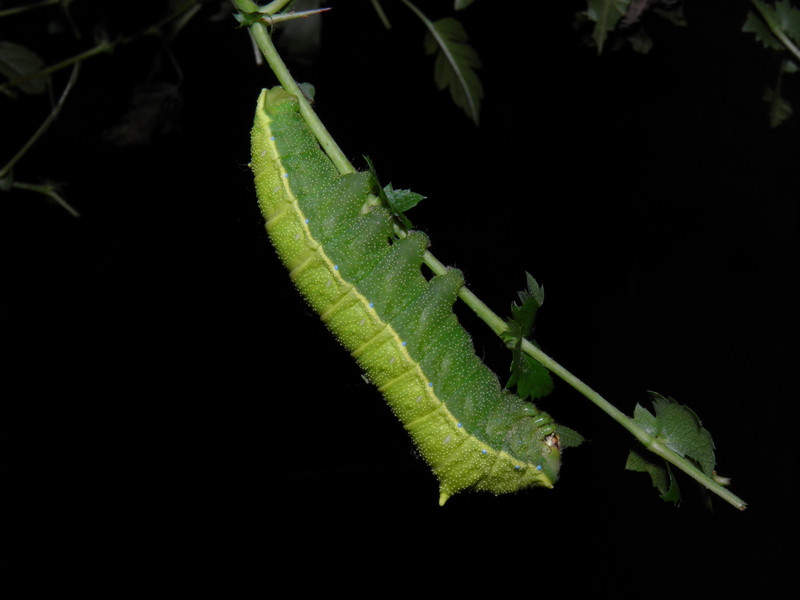 Young caterpillars can then manually be moved into plastic containers containing leaves of their food plants. 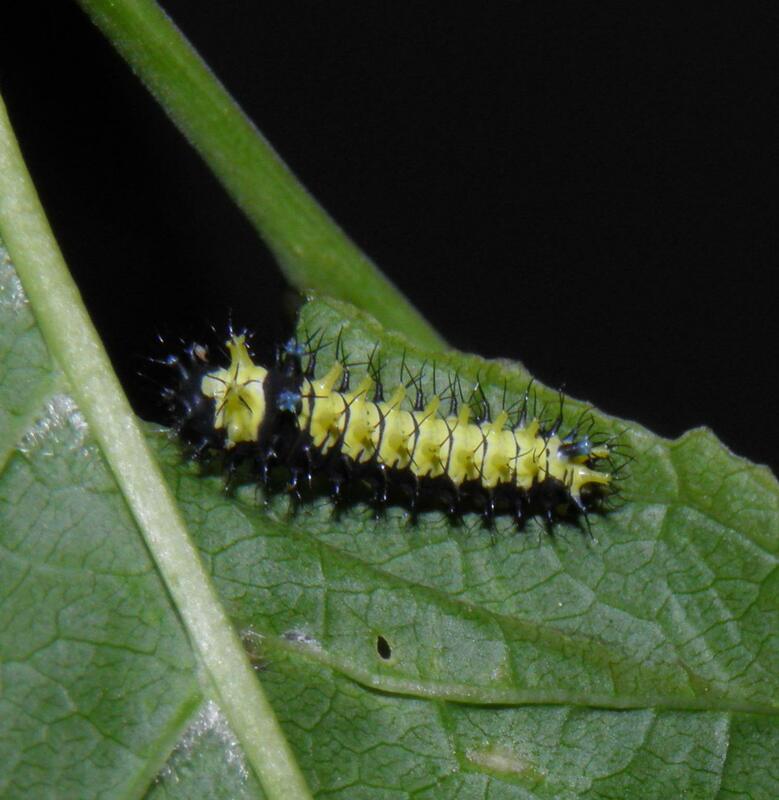 The first instar is small and generally black, with a tiny green/yellow stripe that runs along their side. 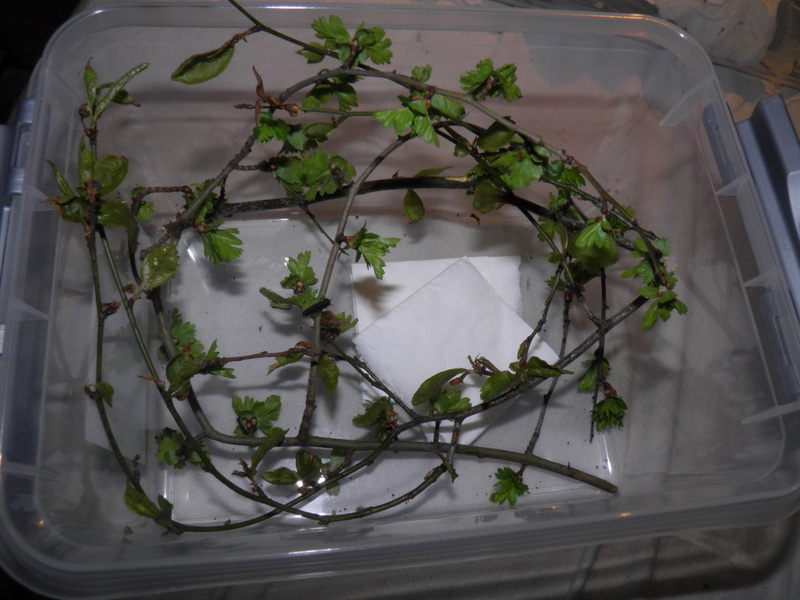 In very early spring, budding hawthorn (Crataegus) can be used to rear hatchlings. After shedding their skins, the second instar is slightly bigger with blue tubercules on the second thorarical segment and rear end, a green back and thorax, while a black stripe runs along their side and over the second thorarical segment. 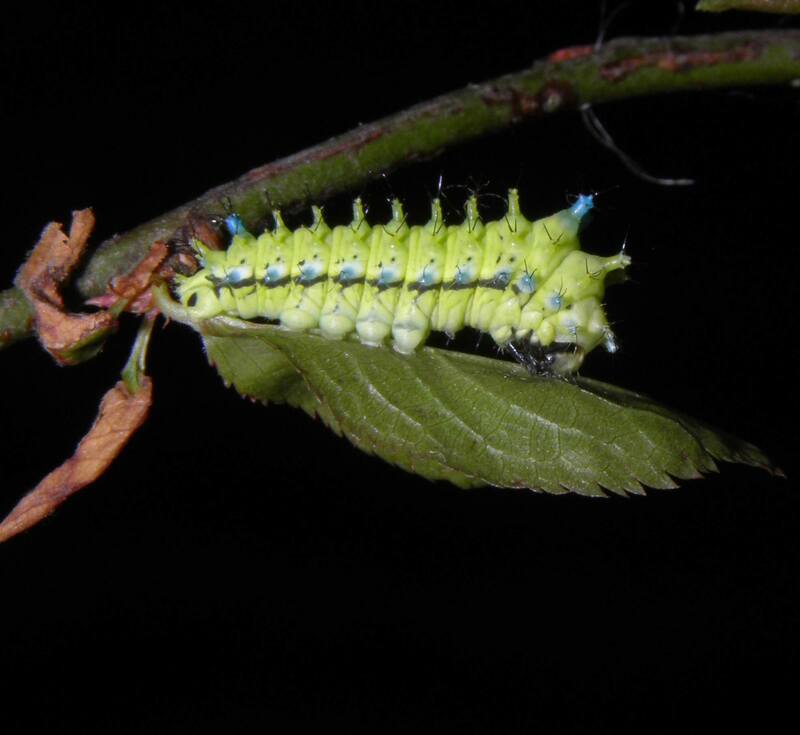 The third instar loses a lot of the black pigment but retains the blue tubercules on top of a generally green body. 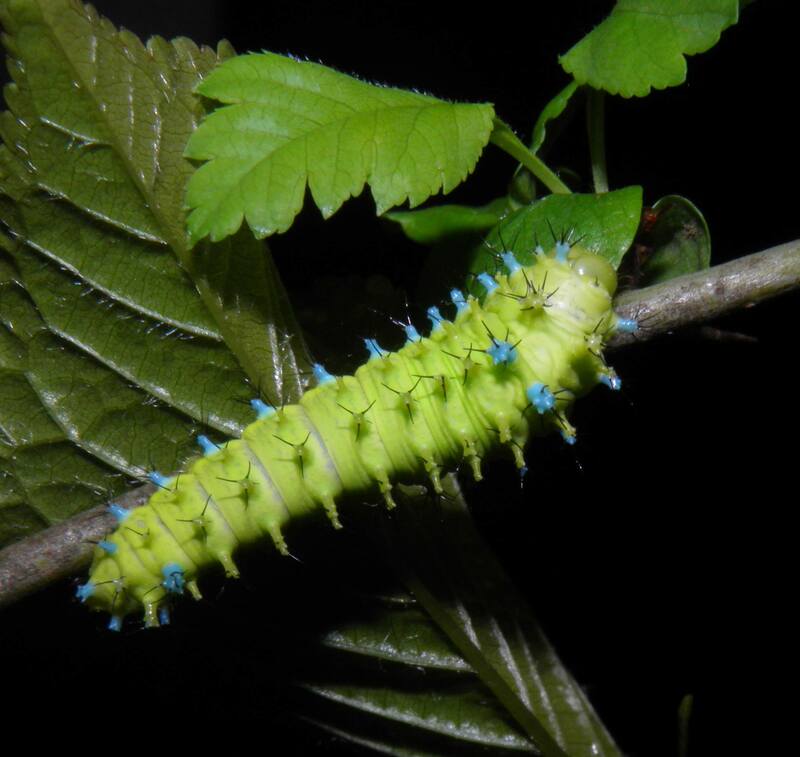 The third instar can be distinguished by the row of blue tubercules running along the side of the body. From the third instar and beyond they should not be kept in plastic boxes and want a lot of ventilation and airflow; they can be raised in sleeves, cages or boxes with the lid removed. The fourth instar has two reduced tubercules on the thorax that rather look like “bumps” where the blue tubercules were supposed to be in L3 and appears to be overall green with no traces of black or anything else. From this instar and beyond the caterpillars will make a squeaking sound if bothered; they can do this by contracting their bodies, which forces the air from their tracheae through their spiracula. 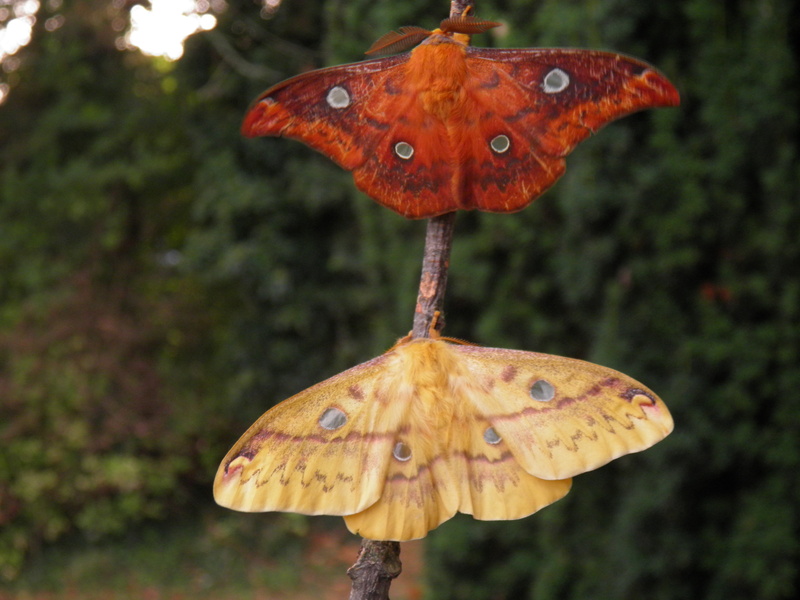 This has given them the common name “squeaking silkmoth”. 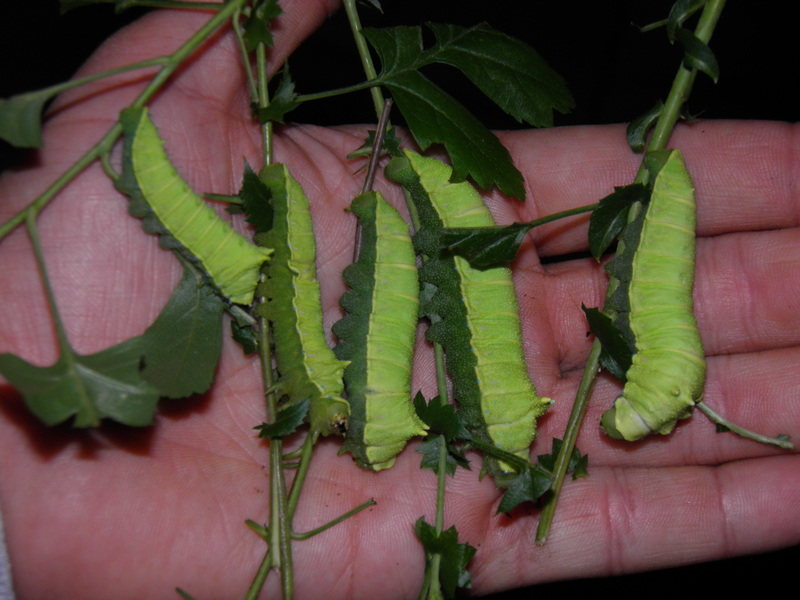 The caterpillars like to feed on a great variety of decidious trees and shrubs, and in captivity they can be forced to eat more plant species than they are commonly found on on the wild. They prefer to feed on Salix (willow), Quercus (oak), cherries (Prunus), hawthorn (Crataegus), Sweetgum (Liquidambar), maple (Acer), Platanus, Cork-tree (Phellodendron amurense), holly (Ilex) and Zelkova in the wild for example. The final instar, L5, just looks like a bigger version of the fourth instar (L4). This species appears to spend a lot of time in the final instar. 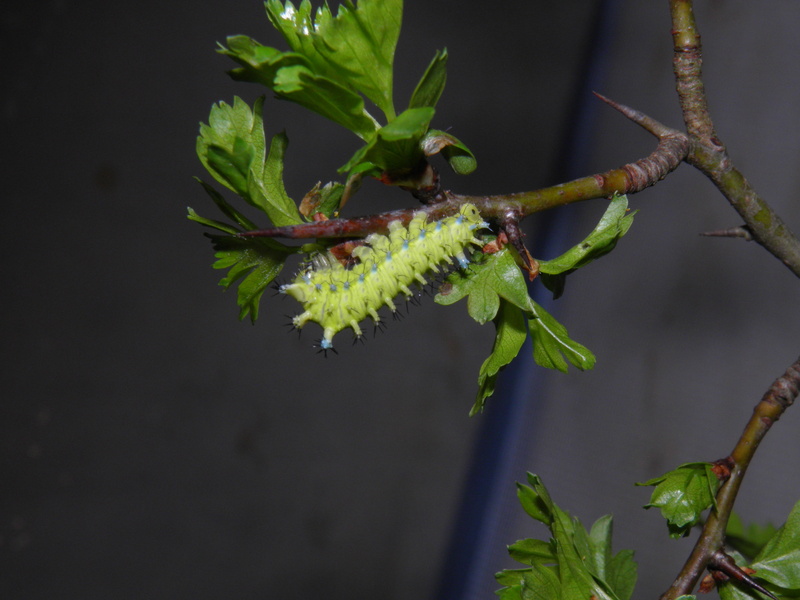 Raising them from eggs to cocoons takes me about 2.5 to 3 months time, although with improved food plant quality and higher temperatures it is probably possible to do it in two months (I have often raised them on Crataegus, as it appears a not very nutritious food plant). 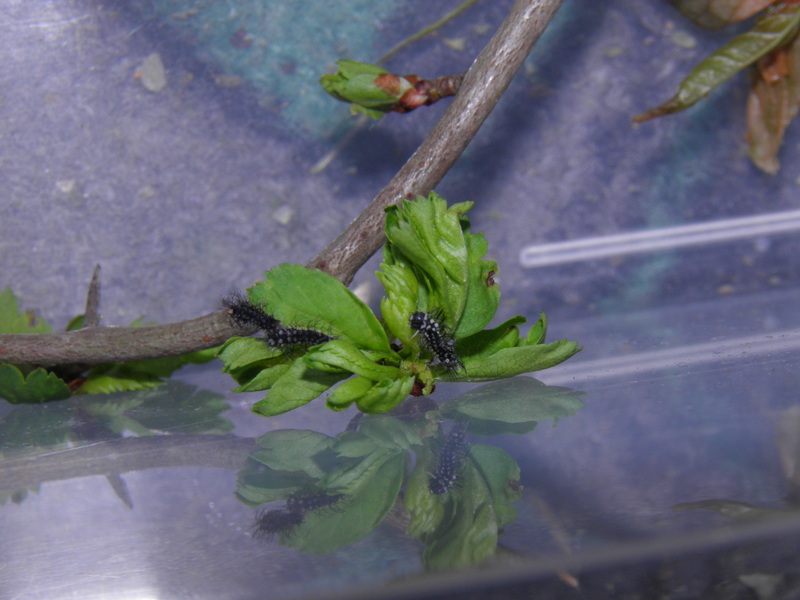 Despite that, they generally spend as much time in the final instar as it takes to raise them from eggs to to fourth instar (L4): so nearly half their time as larvae. After 2 to 3+ months time, the larvae will begin to spin cocoons. 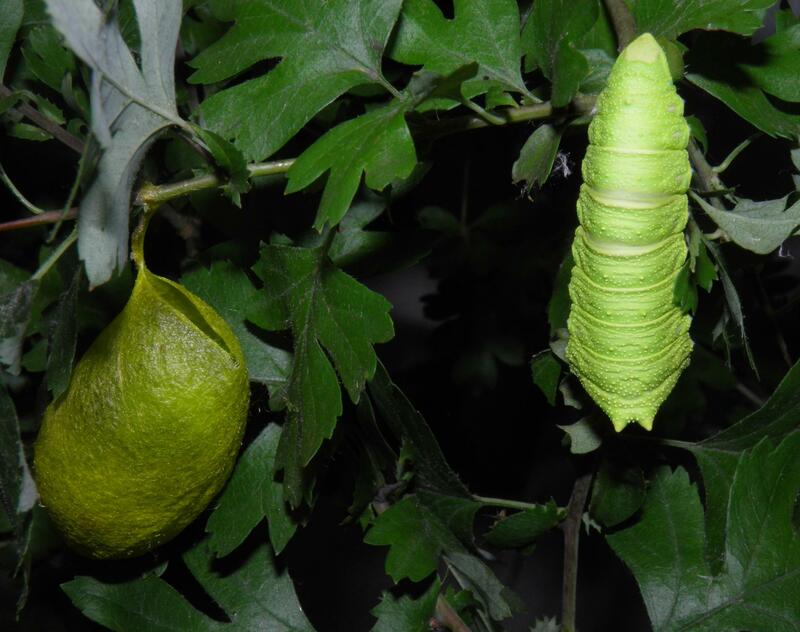 The cocoons of Rhodinia fugax have a very typical appearance; they are oriented vertically and hang from the branches of the food plant by a silk peduncle. 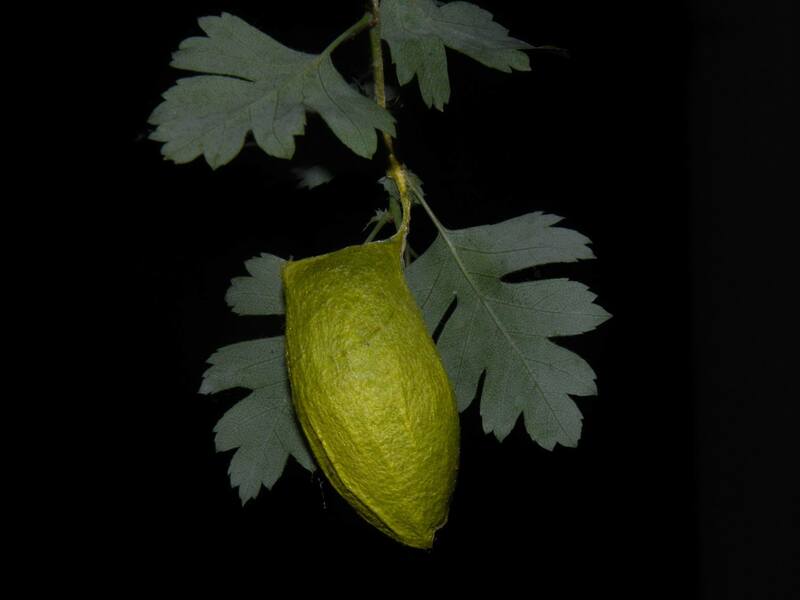 The silk is bright green and interestingly the top of the cocoon is open, but the sides are pressed together, closing the opening. This opening serves as a convenient exit hole for the moth, that only has to open up the slit on top of the cocoon in order to exit it. The imagoes will hatch the same year in fall. Their peak season appears to be around October-November. Males are variable and are darker than the female: they seem to range from nearly black to dark orange, bright orange to brown and yellow. Females are not nearly as variable as the males and are always yellow, although the thickness and colour intensity of their submarginal band can differ a lot. Adults have quite hairy bodies and legs to aid their thermoregulation during the chilly autumn days. Briefly after pairing, the females start depositing eggs. Rhodinia fugax is a diurnal species; this species flies and pairs during the day. In captivity they therefore appreciate (sun)light and a day/night cycle. Rhodinia fugax is a diurnal species. The males become active in daylight and seek out the females; they locate her by smell (pheromones). Handpairing them is difficult, but natural pairings are easy if one male and female are places together in airy pop-up cage (or any kind of cage made from netting) and are placed in a spot with sufficient daylight. Do not place too many females together and do not place them in a dark room, as people tend to do with moths.